We are one of 8 plastic corrugated extrusion companies in North America. We are not only a manufacturer / extruder, but also a fabricator, much like an integrated in the paper corrugated industry. We have 8 plastic corrugated extrusion companies in North America, in Europe, with ¼ of the market size, there are 26 plastic corrugated extrusion companies. We are 10 to 15 years behind Europe in terms of what plastic corrugated is used for, CoolSeal is bridging that gap unlike any of the others. These fluted polypropylene sheets are for interior and exterior use. They are moisture resistant, durable, bendable and flexible. Uses: Plastic corrugated sheet has an unlimited number of uses, both as sheet and fabricated into different products. 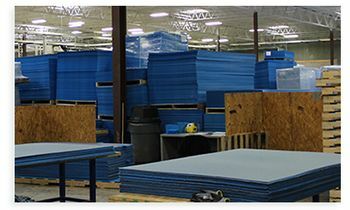 Sizes: Standard sheets – We always keep a number of 4’ x 8’ sheets on our floor, but we have the ability to extrude custom sizes and colors specific to your application, reducing waste and getting you the product that you want. As a corrugated sheet manufacturer, we can extrude our own corrugated plastic sheet in gauges ranging from 2mm to 10mm. We offer stock and custom size sheets in three standard colors: blue, white and black. We can also extrude any color in the rainbow. Plastic corrugated by itself is abrasive to a class A surface. CoolSeal laminates a+ variety of fabrics and foams in house to provide a class A surface protection while still having the structure of the plastic corrugated to build something out of. CoolSeal can meet all of your plastic corrugated die cutting needs. We have a variety of die cutters operating from 3,000 impressions per hour to 300 so that we can meet your needs efficiently and cost effectively. CoolSeal has over 35 years’ experience in the fabrication of plastic corrugated, primarily for the automotive returnable packaging industry. We understand what the expectations are of the product, and how we can supply that product in a fashion that will save your company time and money in assembly. Unlike other extruders, we are not focused on making sheet for the sign industry, we are interested in materials that are going to be converted in one way or another. Die cut to your specification. Standard in 3 colors: blue, white and black. Other colors also available. Fluted polypropylene sheets are for interior and exterior use. For the last 30 years, plastic corrugated has been used primarily for the printing and automotive returnable packaging industries in North America. However, because of our extensive background, CoolSeal is a corrugated sheet manufacturer and supplier with knowledge unparalleled by any others in the marketplace. We not only extrude our own plastic, but we have the design knowledge to make it work for our customers in markets where it traditionally has not been used. As the only independent extruder of plastic corrugated in the country, we are committed to helping our customers find the best and most cost-effective solutions and not pigeon-holing anyone into what has become “standard” in the North American marketplace. In addition to extruding, we also laminate cloth materials onto our plastic corrugated substrates, primarily for class A surface protection within the automotive returnable packaging market. These materials include foams, brushed nylon, and spun bond polypropylene. We have founded our facility much in the same fashion as that of an integrated paper corrugated house, so as to offer our customers fabricating capabilities unmatched in North America. We have created technologies that no one else uses, including high speed flexographic printing using U.V. inks, thermal die-cutting with edge sealing, and high speed specialty gluing specifically for our plastic corrugated. Our quality policy says it all, as we strive to be the foremost extruder and fabricator of plastic corrugated in North America. We are committed to total customer satisfaction in everything we do, partnerships with customers and suppliers, and employee communication and involvement, as we expand the market in new and diverse directions. Call or email us to discuss being your extruded corrugated polypropylene sheets supplier. CoolSeal USA is a fully independent manufacturer and supplier located in Perrysburg, Ohio. 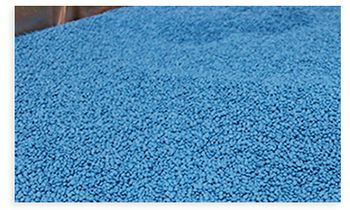 We are dedicated to the manufacturing of extruded corrugated polypropylene sheets and the conversion to CoolSeal boxes. CoolSeal USA delivers innovative packaging for any product shipped in a cold chain or requiring a fiber- free environment. Our products are 100% recyclable and fiber free, and are designed to be a replacement for polystyrene and waxed corrugated packages in the North American Market.